In the heart of the enchanting hamlet at Montfort, La Barde Montfort is a beautifully “Maison Périgourdine” in which lives a charming family who are so happy to welcome you “Frédérique and Pascal”. This delightful B&B is conveniently situated just 4km from the medieval city, Art and History town and capital of Perigord Noir region of France: Sarlat. 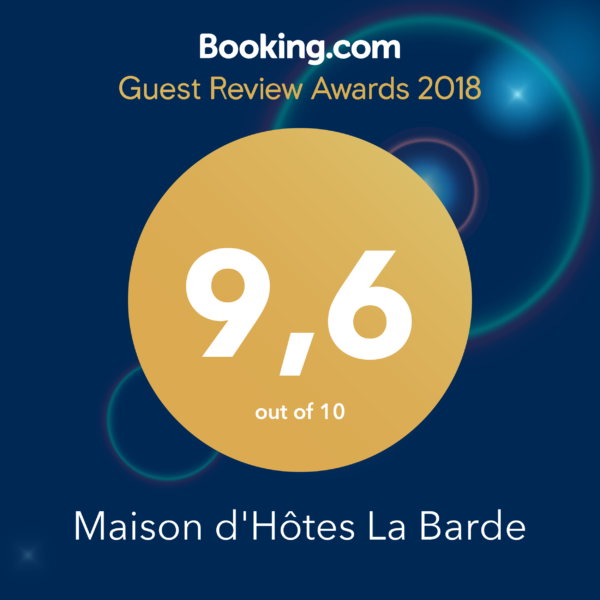 Recommended by Rick Steve and GeoGuide and also referenced at Tourism office of Sarlat and Domme, our house has received 4 Clevacances (Tourism office of the Dordogne label). On 4000 sqm garden, this pretty Bed & Breakfast with view on the Montfort Castle, offers 4 charming rooms and one Family Suite, each of them recently decorated in the goal to propose more comfort. Frédérique and Pascal will take delight in giving you some advices on the places to see, hikings, cultural events but also on gastronomy and local produces. From La Barde, we are near to all of the major sites of the Dordogne Valley as The Castles of Beynac, Castlelnaud, Puymartin, Fénelon and Milandes. Beautiful villages at Beynac, La Roque Gageac, Limeuil and Domme. Formal gardens at Marqueyssac and Eyrignac. Pre-history at Roque St Cristophe, Les Eyzies, Lascaux. Grotto at Padirac, La Cave and Domme. Relax on your holiday here also with golf at Rochebois, canoeing on the river Dordogne, cycling, fishing and the tree-top walk at Sarlat. Finaly, you will discover markets and daily shows in the heart of Sarlat (only during July and August).